Bring this spectacular German Pancake – Dutch Baby Pancake breakfast or brunch dish to the table as soon as it comes out of the oven for a lot of oohs and aahs! This German Pancake or Dutch Baby Pancake is one of the simplest dishes to prepare and one of the most impressive to serve. This fantastic egg dish is a cross between a souffle and an omelet – it is a light and airy pancake with sides. The eggs also get puffed (this egg mixture billows up to unbelievable heights) and crispy around the edges while retaining a pancake-like tenderness in the middle. The sides of the pancake rise high above edges of the pan, creating a light, puffy crust with a tender, custard-like middle. This pancake is also know as Bismarck Pancake, Dutch Puff Pancake, and also David Eyre’s Pancake. * Bread flour is a high-protein flour. The high protein helps the pancake rise. All-purpose flour may be substituted but the results will nott be as spectacular. I used my 10-inch cast iron skillet for this batch. * Bread flour is a high-protein flour. The high protein helps the pancake rise. All-purpose flour may be substituted but the results will not be as spectacular. * Bread flour is a high-protein flour. The high protein helps the pancake rise. All-purpose flour may be substituted but the results won't be as spectacular. I used my 12-inch cast iron skillet for this batch. It is very important that you preheat your oven. Place oven rack on the middle rack of your oven. Place a large, heavy ovenproof frying pan or a cast iron skillet, in the oven until hot and sizzling. While pan is heating, prepare your batter. Use a shallow pan, not more than 3 inches deep (pie pans, cast iron skillets, oven-proof fry pans, baking dishes, paella pans). Like I said before, I prefer using a cast iron skillet or pan because it acts as a heat reservoir, retaining the heat and distributing it evenly. 2. In a large bowl or blender, beat the eggs until light and frothy; add milk, flour, vanilla extract, and cinnamon; beat for 5 minutes more. The batter will be thin, but very smooth and creamy. You can also use your blender or Vitamixer. Using pot holders, remove the hot skillet from the oven; add the butter; tilting the pan to melt the butter and coat the skillet. I never remove the hot skillet from the oven, but just pull out my oven rack. 3. Pour the prepared batter into the hot skillet, all at once, and immediately return the skillet to the oven. 4. Bake approximately 20 to 25 minutes or until puffed and golden brown (bake until the pancake puffs up around the edges - it may puff irregularly in the center. The timing will also depend on the size of your pan or skillet. 6. To serve, cut into serving-size wedges and transfer to individual serving plates. Top with your favorite topping and serve immediately. For a classic German Pancake/Dutch Baby, sprinkle with freshly squeezed lemon juice, and dust the top with powdered sugar. See other Topping Ideas below. The photo showing the thicker custard-like filling is from making the large Dutch Baby Pancake. Blueberries - Pour prepared batter over approximately 1 1/2 cups fresh blueberries and then place the skillet in the oven. You could also top the cooked pancake with berries of your choice. I just wanted to write and tell you that I had been searching for a few years for this recipe, as I was always told of the amazing German Pancakes I used to have every Sunday at a friends were a form of waffle. Well I decided to do a search for images and put waffles in and nothing looked like the mysterious food I used to eat. I figured what the heck, I will put pancakes in the search. Then I seen your picture of the pancakes and I knew they had to be them! Never heard of German pancakes, never tried them before. I found this recipe and made it today. It was GREAT! Why is everyone calling it German pancake when the name is Dutch pancake? Dutch is from the Netherlands, Deutsch is from Germany..
Having said that, I am Dutch and we don’t have this style of oven baked pancake, ours are like crêpes, thin and fried in a frying pan. Because the German word for German is Deutsch. It’s a version of that word. 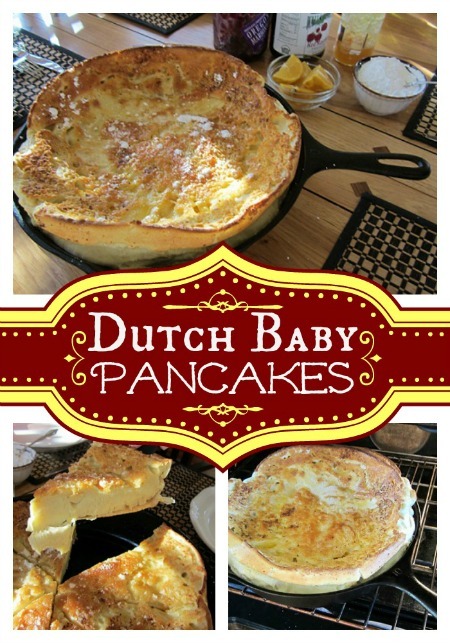 “Dutch” Baby name – another cite said a young boy associated with a Seattle restaurant could not say the correct pronunciation of the German “Deutsch”, and pronounced it as “Dutch”, and it was a popular item at the restaurant, hence the current name of “Dutch Baby”. My understanding is that it possibly originated in Germany with other variations throughout Europe? Exactly what i was thinking ! Some people j7st want to think they “know” EVERYTHING ! Yes thats the same recipe i have been making for 40+ years. Elmers pancake house chain also has made it for decades. After bringing out of the oven, I put lots of butter in the center and get it all wet on the inside, put in the powered sugar and lemon, your making your own surup . then fold it up in a square, holding all the stuffing inside. When you cut the square, all the stuffing material ooozzzes out and is wonderful. My favorite breakfast. And yes I’m german and the recipe was handed down from my great great grandmother. I can send pictures also, smiles. Yes can you send pictures and your version of the durch baby pancakes? Never heard of this before or seen it at the restaurant. Will have to give it a try since I’ve never had such thick pancakes before. I’m curious to see the taste. My Grandmother born 1865 in Germany, made German pancakes – they were like a thick crepe and curled up on the edges. We grew up in Cincinnati. 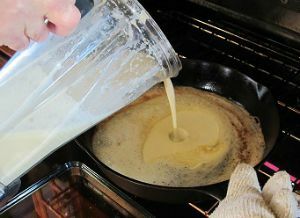 One of the KEYS to the pancake (not made in the oven but in a cast iron skillet on the burner) was the use of CRISCO. We begged always for more – they were the most delicious. I don’t remember them puffing up at all. The toppings we used were confectioners (powdered) sugar, but we made a Blintz, where you put cottage cheese, cinnamon and sugar stop and rolled the pancake up. It was the BEST. My mother made this recipe calling it an”oven pancake.” I saw a similar dish at a pancake house where it was called a “German pancake.” Now, just for fun, I will tell you that she also made “Norwegians,” which apparently were crepes made from thin batter, were cooked in a small range top skillet, and were rolled up with syrup inside. So, when I made the acquaintance of a young lady from Norway, I asked her whether she had ever heard of them. Of course, the answer was. “No.” I suspected it was one of those deals where a recipe was renamed somehow. We enjoy Oven Pancake, Norwegians, and good ole toast and jelly, it’s all good! Have been making for years not using vanilla or cinnamon. Also add melted butter back into batter after preparing pan. Secret is to froth eggs, finish batter and put in oven immediately, then it is very fluffy. Like idea of blueberries, will try! Also, for double batch I use the bottom of broiler pan, works very well! I make these all the time. Known as “Dutch Baby”, but I saute apple wedges (not slices) in butter and sugar/cinnamon. Then pour batter over apples and pop in oven. Delicious! Any clue how many carbs per serving, as is?